Brisbane - South Africa's bowlers battled in the first Test against Australia at the Gabba, according to debutant Rory Kleinveldt, with the pitch lacking the pace and bounce they expected, negating the Proteas' decision to pick four seam bowlers. "I think we did struggle a little bit, especially after having them at 50 for 3," Kleinveldt admitted on Thursday. "We thought that we could maybe push on, push for the victory, but (centurions) Michael Clarke and Ed Cowan played well for them. "I wish I could have done a little bit better, but that's how it went, so I've just got to pick myself up and prepare well for the next Test match, and hopefully that will go better." Kleinveldt was told he would play in the first Test the night before the game, as the South Africans believed the pitch in Brisbane would offer the fast men something with which they could work. "We thought there was going to be a bit of pace and bounce in the Gabba wicket. 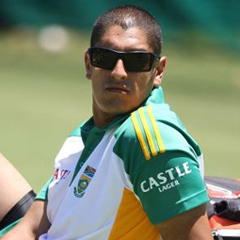 It looked a little bit green the day before," Kleinveldt said. "We thought the wicket was going to (move the ball) around and four seamers would be the way to go." No balls were a problem for South Africa's attack, with Kleinveldt guilty of bowling 12 of the 23 no balls sent down by the Proteas during the match. "It hasn't been a problem (in the past)," he said. "In the warm-up game I didn't bowl one no ball. I don't remember Vernon (Philander) bowling a no ball in the warm up game. "I think all the bowlers struggled with no-ball issues. There was a little bit of a ridge as you came up towards the wicket but I don't think that was the issue contributing to everyone bowling no balls. "I think if we had an opportunity to bowl out in the middle before the game, maybe we could've worked something out. It's pretty tough to work something out during a game." The Cape Cobras player said the loss of part-time spinner JP Duminy, who injured his Achilles during a warm-down session after the conclusion of the first day's play, was a big blow to the Proteas and their bowling strategy. "It was a massive blow for us, especially with Australia having seven left-handers. He was our off-spin bowling option," Kleinveldt said. The second Test between South Africa and Australia starts in Adelaide on November 22. With Duminy out of the tour, and Adelaide known to offer spin bowlers more turn as the game progresses, South Africa could bring in both Faf du Plessis and Imran Tahir. For Australia, Shane Watson could be included, depending on whether he is deemed fit enough to bowl.